Social Work Practice in Mental Health 1 Edition This new edited text presents a "partnership" model and aims to be cutting edge, scholarly, and unambiguously useful and practical. 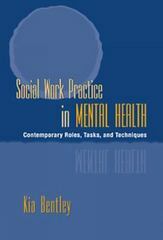 Kia J. Bentley and the other well-known and respected contributors address the need for approachable, immediately useful discipline specific content on the most important social work practice roles in mental health. The book articulates how roles often associated with working with a specific population (e.g. those who abuse substances, persons with severe mental illness, distressed marital couples) are quite relevant and useful in a much wider range of populations.